This document is for those who “hate” to use the out of box roles and menus that are delivered with any SAP implementation because they usually provide way more access then is needed by differing user types, and are a pain to figure out how to turn items off with all of the back-end PFCG manual role entries. Many times you are left with links or Menu items that are not configured in your system visible for all of your user base, which then usually ends up with a help desk call to fix something when our curious user base starts to search around your new site. My goal was to create Group specific PFCG roles that would be tailored to those groups requirements based on internal and external audit recommendations. After spending a couple of weeks searching through all of the differing posts in regards to creating your own customized Menu items in GRC 10.1 I have complied a hopefully very easy walk-through on how to accomplish this on your own. I would like to give credits to both Colleen Hebbert and Manik Saldi for these initial SAP blogs/wiki documents that helped explain the concepts but I thought could use some clarification as some things have changed since they were originally written. Requirements: SAP GRC access to SE80 and an SAP Developers key for your environment. 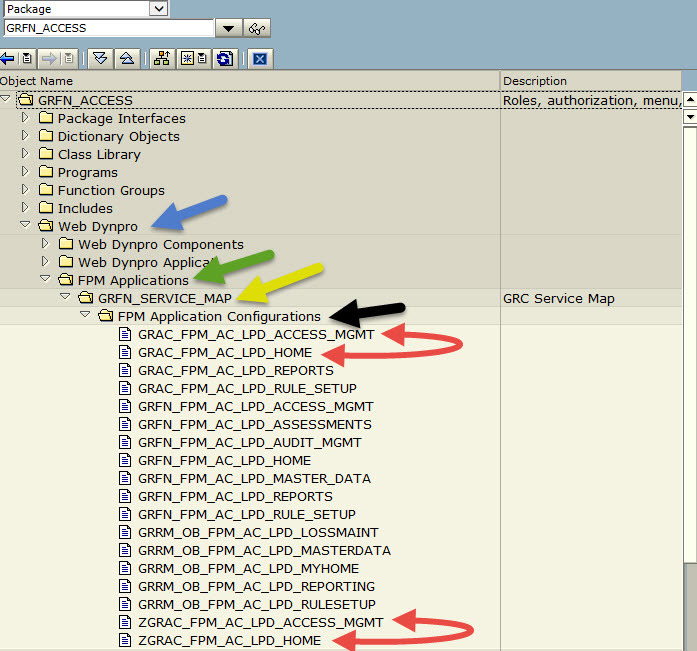 In this step you are going to use SE80 to search for the standard SAP package of GRFN_ACCESS where the web-dynpro application lives. From there I drilled down to the “FPM Application Configurations” folder and created the following two copies of Menus I am going to update. Next I created my new Menu Roles that I will be linking to the relevant configurations in the Web-Dynpro configuration screens later in this article. Since I am working on the “Menu” and “Access Management” tabs I will make copies of those two Roles using the “copy” function. For my Home, I did not want my users performing any of the password management functions as we have a 3rd party application for this or using the SAP Support functions that would redirect them to Marketplace. First create a test role with the NWBC Tcode, and a Folder Name for the Tab you want to create. In my example I am working on the “My Home” tab. ***** If you add Tcodes directly to this or any Webynpro role you will need to do so at the root of the role menu and not inside any sub-folders. If you put the Tcode in the sub-folder it will show up as a option for the user on the page. This will allow you to at a minimum launch the web-dynpro application to validate you config and menu changes. ******** Links in the menu can be worked on later using ST01 traces to identify link authorization requirements. Now that you have saved and Genereated the role, go back to the “Menu” tab of the role and right click on the Web Dynpro service and select the “Details” screen. 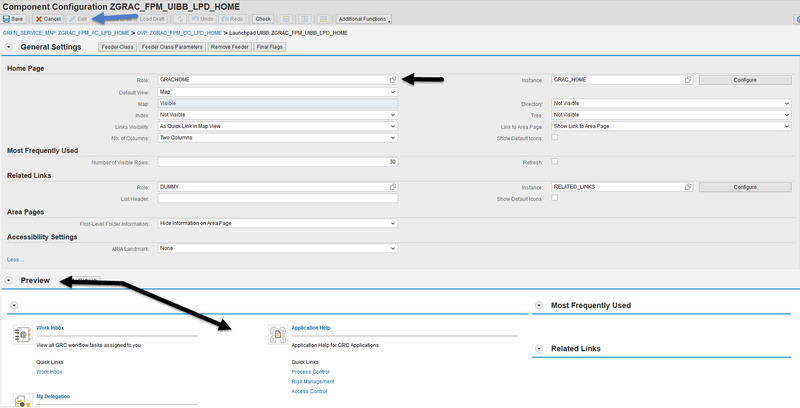 Next you will click on “application configuration” button to enter the Web Dynpro configuration screen. 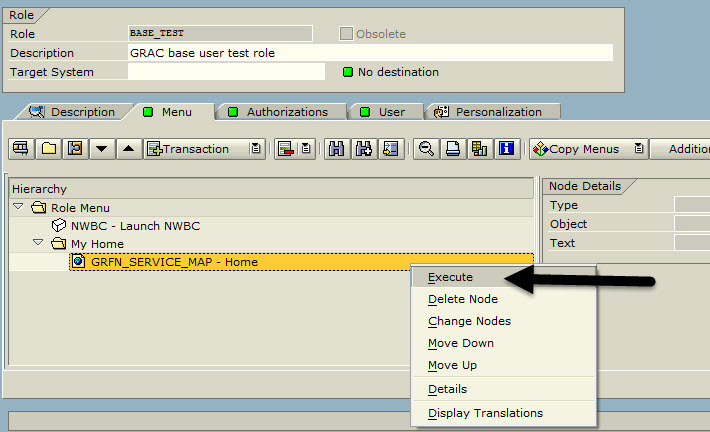 ***** Please note that you CANNOT copy any of the SAP standard configs after this via SE80. You MUST use the Application Configuration button below. 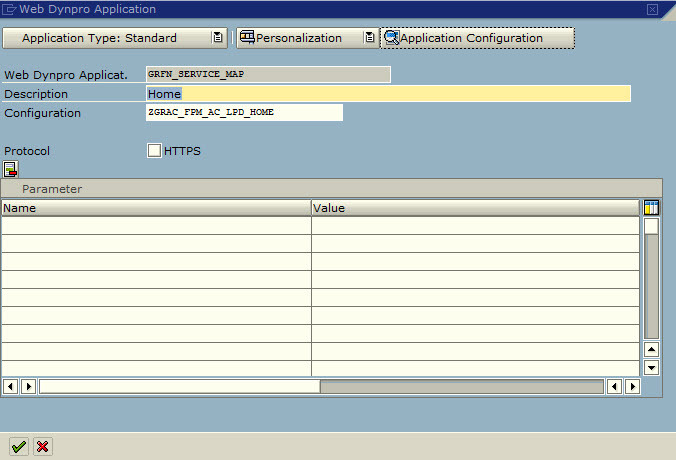 If you try and copy the FPM_OVP_COMPONENT in SE80 NONE of the SAP provided config will come over in the copy. You should now be in the Web Dynpro component configuration screen. 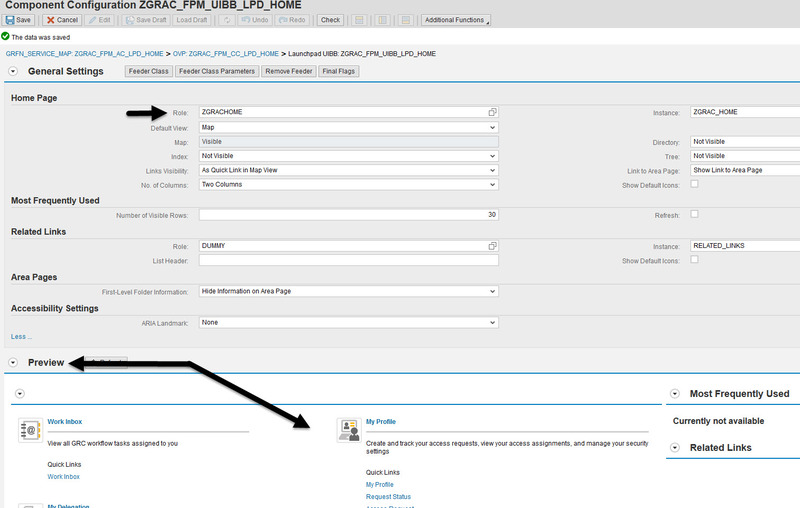 On this screen you should see the origina SAP configuration ID “GRAC_FPM_AC_LPD_HOME”. NOTE** If you do not see a “copy” button click on the “New Window” button. You will then be prompted to assign it to a package and also to create a Transport for this if one has not already been created. I would suggest creating a Transport package just for this config so you know what you are moving into your QAS and PRD systems. If you do not have a custom package for your system. Work with your basis team to create one. Once created you should now be able to continue on in “change” mode to update your new custom configuration. 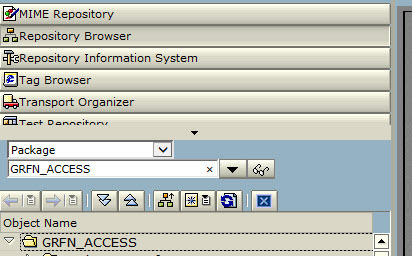 Click on the configuration ID in Edit/Change mode and that will take you to the Configuration ID Main Page. 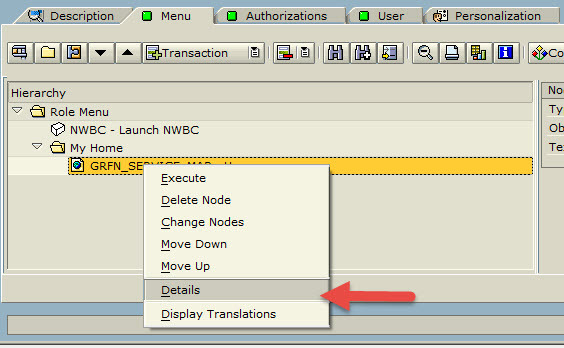 In the “Overview Page Schema” section select the UIBB for the FPM_LAUNCHPAD_UIBB and then click on the “Configure UIBB” button. NOTE***** If you get prompted to provide a Object Registration Key then click CANCEL. you will be making a copy and should not change SAP provided configuration. The configuration screen automatically prompts you before you can choose copy. You will again be prompted to save it to a custom package and transport. Use the ones you set up for the first configuration ID copy. Once you copy the Confuguration you will then be taken to the “Component Configuration” page. Here you will need to click on the “Edit” button and then select the Search button next to Role. NOTE**** In this screen you can also see the preview of what the page looks like before you update to the custom role. Take note so you can see the change. NOTE*** There is not “Close” button so at this point you can just close out the screen. You configuration is completed. Step 7: Test your Page!!! If you have followed all of the above steps then you should be ready to test your page in the role you created. This will bring up your final page. You can now assign this role to a test user and start to identify what may required authorizations to populate any of the links that need them. In my case I will need to go back and identify the authorizations to populate the “My Profile” links via ST01 and my own ID. I hope this article helps the future GRC admins of the world and I look forward to creating more documents later on other topics I find could use some clarification.